Mountain biking in Bhutan is one of the most thrilling adventure activities whether you are hitting on a two-way lane road or off the beatten path. Both constitute exhausting experiences and most rewarding venture. Undeniably Bhutan is a true bikers paradise and a home to the world’s toughest mountain biking race “Tour of the Dragon”. The racing event is held in a day over 268 kilometers distance annually. The road track unwinds through lush mountain passes, picturesque landscapes and deep gorges offering a unique Himalayan adventure tastes. 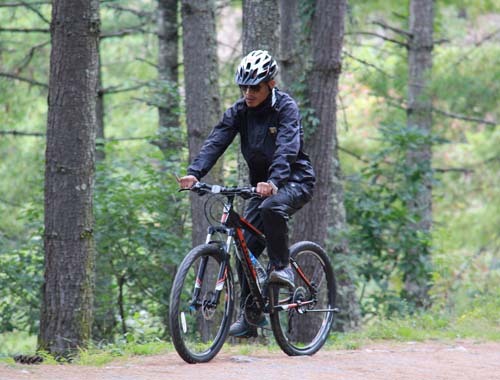 The mountain biking adventure in Bhutan spans from a few days to a month long and the actual adventure duration will depend on the number of days you wish to spend in Bhutan. 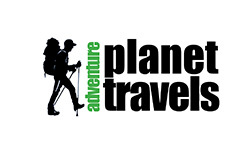 Adventure Planet Travels will ensure its expertise for tailoring custom made biking trips to suite your interest and level of adventure. This phenomenon 8 days western Bhutan mountain biking tour will unveil the beautiful western province of Paro, Thimphu, Punakha and Wangdue offering the adventure of a lifetime. The biking trail runs over eye captivating landscapes, serene and lush forest, breathtaking mountain passes, sparse valleys and along the murmuring Himalayan glacier fed riverbanks. And by far and in general context, road biking has been the most preferred choice by the multitude adventurers from abroad. However, depending on the level of adventure quest, off road biking can also be tailored. And Bhutan has well established off road biking trails especially in the western Bhutan provinces. Bikers are at liberty to either bring their own bikes or use the rented one in Bhutan. However, it will be good decision to bring their biking own wears to retain maximum comfort. Essentially, a biking group is escorted by a certified local guide, technical personnel and a carriage truck to ensure maximum take back by the guests. Besides mountain biking, cultural sightseeing, fascinating village hikes and photography will be some of the highlights of the tour. Enjoy a fascinating biking adventure through pristine forested landscapes, by the meandering riverbanks, through sparsely populated valleys and across mesmerizing mountain passes. Come in close contact with local folks and soak up in a local culture. Venture on challenging hike to tiger nest in Paro. Visit the ancient giant fortresses and monasteries. Experience the traditional hot stone bath in and dine with local family in a traditional farmhouse. Head light and back lights. A pair of full sleeve shirts and pants to be worn while visiting the dzongs which houses the government offices. A pair of hiking / walking shoes. Take a mountain flight onward Paro and enjoy the close up view of breathtaking Himalayan Mountain ranges including the majestic Mt. Everest and Mt. Kanchenjunga. At Paro international airport you will be received with traditional welcome by our tour executive who shall then make a straight drive to hotel for the arrival refreshment and get prepared to hit the road on bike. Firstly, from the hotel head to Ringpung Dzong via shari village amidst terraced rice field and to the national museum to capture the views of broad paro valley. On completion of sightseeing reverse to paro town for the lunch break. 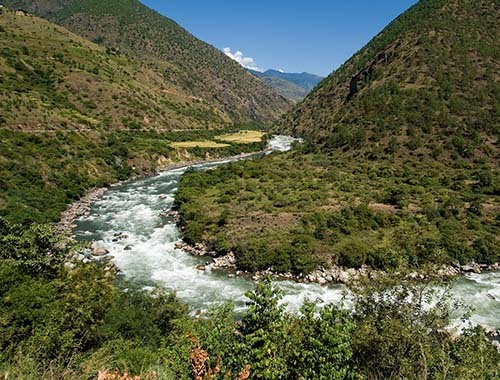 After the lunch, enjoy your fascinating ride to Drugyal following the Paro riverbank with scenic 360-degree views of vast expanse valleys filled with rice fields and traditional buildings. Evening spend your leisure time strolling in the main town of Paro and interacting with the local folks. Thereafter, soak up in a warm hospitality of your hotel. 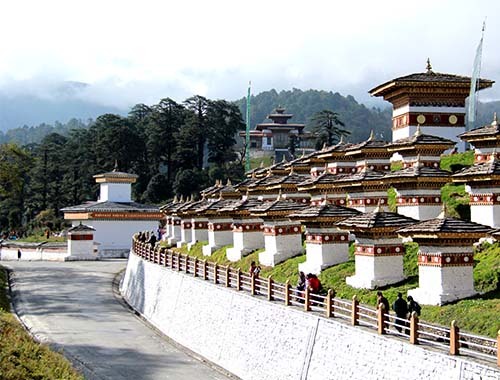 Thimphu is the modern capital of Bhutan and it is located at 55-kilometer distance from the main town of Paro. The national highway passes through beautiful villages and along the bank of Paro and Thimphu Rivers. This fascinating bike ride to Thimphu is one of the best road biking spots in Bhutan and it does not demand exhausting energy. In fact it will fill up your physique with thrilling experiences. On average the ride will last for three hours on the road until you arrive Thimphu. Additionally, the ride shall include brief stopover at scenic viewpoints and river confluences for photography fun. In Thimphu ride to Kuensel Phodrang, the site of the tallest bronze Buddha statue in the world and enjoy the view of Thimphu city and its northern valley. Following take a joy ride to BBS tower en route Motithang locality through the rising hills of lush Sangaygang viewpoint. Spend circa 20 minutes soaking up the picturesque view of Thimphu valley. Evening relax in hotel and enjoy the warm hospitality of your host hotel thereafter. 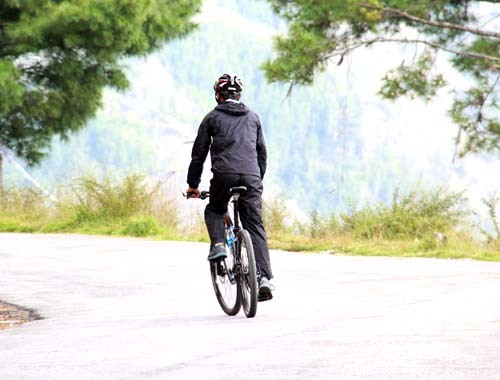 From your hotel take a refreshing bike ride to Tango and Chari located in the north of Thimphu valley. The road trail passes through beautiful village of Langjophaka, Dechencholing, Kabesa and Begana all situated on a gently rising hills offering energy draining adventure. Add to it, the breathtaking views of towering mountains, infinite lush greenery and fabulous rural settlement will glorify your quest for true Himalayan adventure over hilly landscapes. 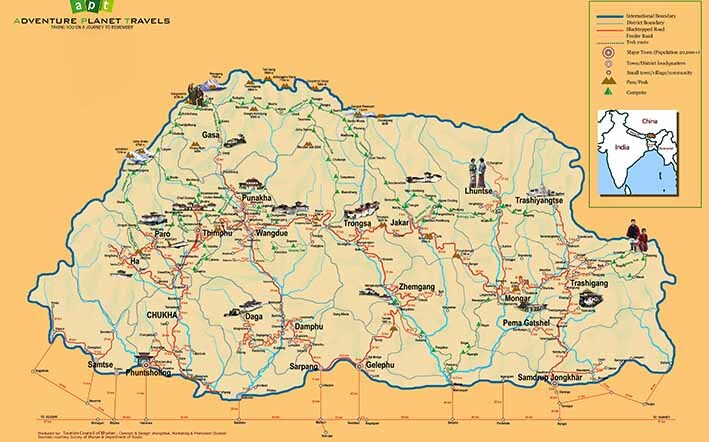 Spend circa twenty minutes at the based of Tango and Chari monasteries and enjoy your reverse downhill ride to Thimphu. You will be treat gourmet lunch in the local restaurant. Afternoon program will be exclusive visit to Painting school, national museum, Chnagangkha temple, Jungshi paper factory and Tashichhoe Dzong. Evening stroll in the main town visiting souvenir shops and enjoy the sight of bustling Thimphu city. 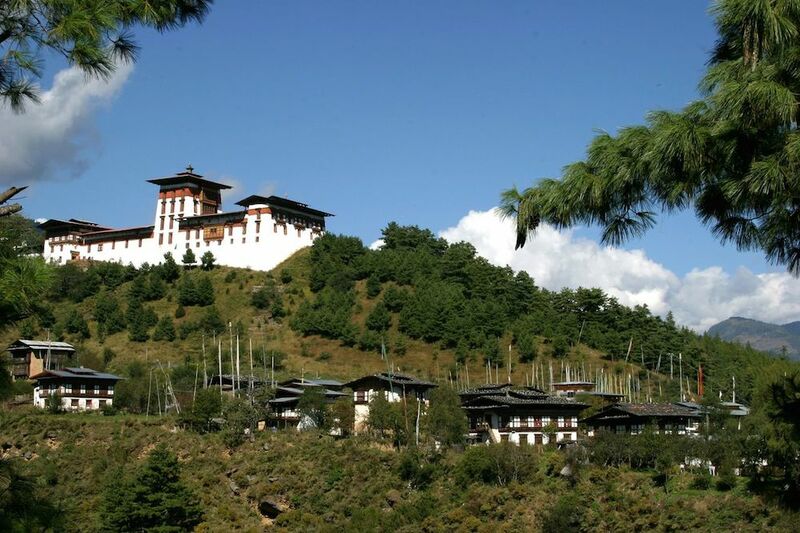 Today, depart for Punakha the erstwhile capital of Bhutan, 77 kilometers eastwards from the capital city on bike. Hotel check out will be done as early as possible to avoid excruciating heat before making up to Dochula mountain pass. An hour-long bike ride until the pass will demand adrenaline-pumping efforts over the gently rising hills of Simtokha, Yesupang and Hongtsho. Once at the pass enjoy the beautiful sights of druk wangyal chhorten, colorful fluttering prayer flags and distant view of Mt. Kulagangri and Gangkar Puensum. On completion, you will be treated hot tea and coffee at the cafeteria located in the close proximity of the pass. Then you will hit the road for your downhill ride all the way to Lobesa through winding thick broad mix forest and rural valleys. At Lobesa, take a short ride to Chimilhakh through small hamlets over feeder trail. Lunch will be treated in the local restaurant at lobesa and following continue your ride to Punakha. If favored by time, take a joy ride to Norbugang overlooking the lower Punakha valley. Evening freshen up in the hotel and take a walk through the serene pine forest of Wolokha community. Early breakfast in the hotel and start your bike ride to Kabesa in the north of Punakha. The biking trail will follow the main road passing by the side of giant Mochu River through beautiful villages spreading over gorgy landscapes. The ride is graded as easy and one just has to keep peddling over straight road trail until you arrive at Kabesa. From Kabesa enjoy the scenic landscapes of the valleys, mountain terrains and murmuring down flowing Mochu River. Following, reverse to Khuruthang main town to treat yourself a hot lunch. After the lunch continue your ride southward to Wangdue over the road trail on the left hand side of the river all the way to your hotel at Bajo. Hotel check in, and spend rest of your time either in the swimming pool or exploring the small township of Banjo on bike. Morning take a round trip bike ride to Chuzomsa, Wangdue, 7 kilometer eastward on a straight road trail. On completion you will be served gourmet lunch in the hotel followed by straight driver excursion to Paro for night halt. Locally known as Taktshang meaning the tiger nest, stunningly located on the stiff cliff, is not only revered for its historic Buddhism sanctity but also for fascinating hike through mixed alpine forest it has to offer. So, after break fast in the hotel drive to north of Paro through rural communities up to the base of Tiger nest from where the hike will start. Make a gentle climb straightforward through pine forest until you encounter water prayer wheel in a small gorges. From the spot, the trail meanders over raising hill, which demands, frequent gentle climb and occasional exhausting efforts giving the true experience of Himalayan adventure. After crossing the stupa and prayer flags on hill top, take a straight walk to the viewpoint cafeteria at stone throw distance. Here you will be treated with tea, coffee, snacks and desirable short rest after which hike will continue further. Take a slow climb until you reach the scenic viewpoint opposite to the Tiger nest temple. With maximum caution, make a steep descend through rocky trail until you make to a small bridge where you can enjoy the cool breeze of falling stream. Another five-minute steps climb will reach you to the courtyard of Tiger nest. At the Tiger nest you will visit all the permissible temples including the mediation cave of guru Rinpochhe. Besides, enjoy the breathtaking views of valley and greenery from the courtyard, outside the temple. Hot lunch will be served at viewpoint cafeteria after returning from the temple. Evening, capture the last minute sights and scene of Paro town on your own or with your local guide. After early breakfast in the hotel you will be driven to paro international airport to catch up your light for onward journey home.